This post is going to be about the 88 matte palette from Coastal Scents. Note: I added the "bling" to mine. I just had some self sticking gems that I put on the front. I thought with the holidays quickly approaching I should do a post about this palette as it would make a great gift for anyone on your list whether it be a teenager who is beginning to get into makeup, your best friend who loves makeup and has everything makeup related (except for this), or your cousin who is a professional makeup artist. 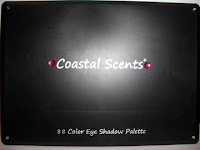 If there is someone on your list who prefers shimmery colors or prefers more neutral colors you are in luck because Coastal Scents has 3 different 88 color palettes. They have a shimmer, a matte, and a warm. 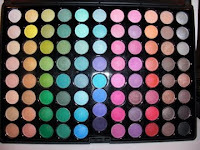 The 88 color palettes range from $18-$25 depending on which one you get. The colors in this palette are about the size of a dime. One thing I love about this palette is even though it looks like there isn't much color or that it won't last very long, they last for a very long time. I have been on a neutral eye kick for the past month and a half and I have barely made a dent in the color that I use all over the lid. The other thing I love about this palette is that not all of the colors are actually matte. Some have just the slightest sheen (definitely NOT a shimmer) to them. Go to the Coastal Scents website and pick up one or all of these palettes either for yourself or as a gift. These are an amazing deal and they are very affordable! Matte nails are a new trend! Makeup remover...why I use two!